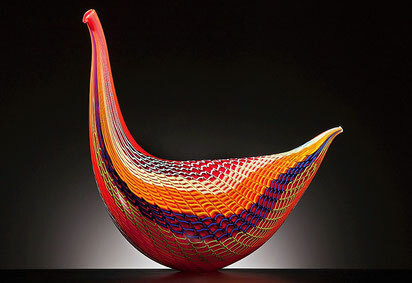 Born in 1934 on the island of Murano, neighbouring Venice in the Venetian Lagoon, Lino Tagliapietra started from a very young age working at the island’s glass furnaces and factories. Lino was soon regarded as a Maestro - master glass blower - in his early 20’s and granted with that title in the 1950’s, at a time when he worked for some of the most prestigious glassworks companies in Murano. During the 1960’s Lino started expressing his own forms of creativity through the design and execution of models with high technical and aesthetic quality, which earned him significant commercial success. Since 1990 Lino has become a free practicing artist of glass without any contractual binds or obligations, and he is now fully dedicated to creating his unique pieces that are present in some of the most prestigious museums throughout the world, including the De Young Museum of San Franscisco, the Victoria and Albert Museum of London, the Metropolitan Museum of New York, as well as numerous galleries and private collections. Through his continued creative experimentation and mastered skills, Lino has developed a very personal style that is unmistakable and easily recognized, thus his exemplary practice is followed by many as a great source of inspiration. Both creator and executor of his works, his creativity is upheld by production skills that come from a life of experience; and it is through that wealth that he continually explores the possibilities of a perfect execution. This is further enhanced by his personal experiences, encounters and exchanges, as well as a wide variety of different interests, where the glass however always takes first place priority. In 2009, the Museum of Tacoma dedicated a major travelling retrospective exhibition of Lino’s work, which was also hosted by other museums in the United States. During his extensive career Lino has received numerous awards including: the 2004 Honorary Doctor of Humane Letters at Centre College, KY and The president’s distinguished artist award, at the University of the Arts, Philadelphia, to name just a few. In 2013 he gained the “Visionary Award”, at the Art Palm Beach, Florida; in 2014 the “Career Award” from the “Istituto Veneto di Scienze, Lettere e Arti”, Venice; and in 2015 the “Best Glass Work Award”, Masterpiece exhibition, London.